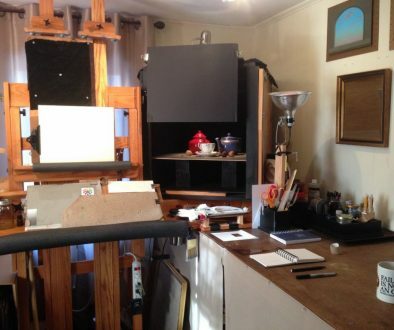 Many artists – even established professionals – have an uneasy relationship with perspective. That’s understandable, given how involved it can be to figure out, say, the proper perspective of a complicated geometric shape with multiple vanishing points. It’s good, and I think necessary, to know how to do this. But, in the real world, I only work out perspective formally if it’s an especially difficult subject. I suspect most artists are like me and do it by eye 95% of the time, or more. 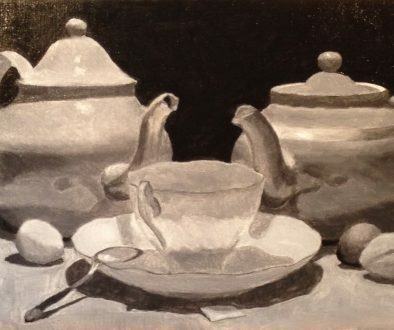 In this week’s painting, I have a couple of important ellipses to make right: The lids of the teapots, the rim of the teacup, and the form of the saucer. Because they appear at different angles to my point of view, they will have different depths. These are the most important features in defining the space of the picture. If I don’t get their perspective right, the objects won’t appear to sit correctly in that space. The formal way to determine their shape would be to first think of three squares laying horizontally at different heights. These would be worked out with proper alignment to the primary vanishing point. The ellipses would then be drawn within the boundary of each square. Instead of that, though, I just use an informal trick. I think about the ellipses as a stack of flat circular disks – hockey pucks, pancakes, CDs; it’s all good. I then imagine how the stack would look if I started removing disks. 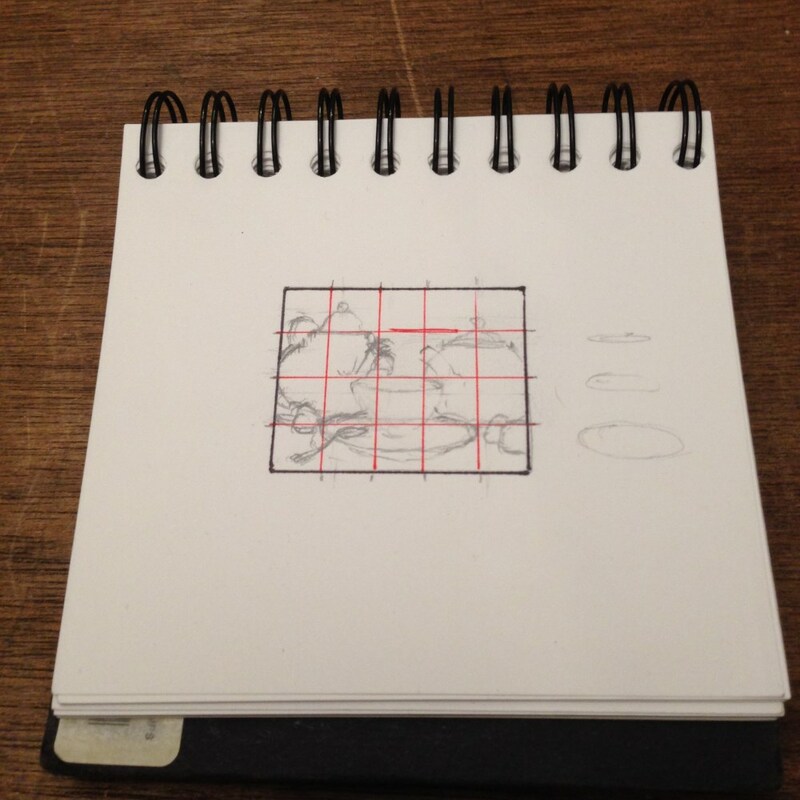 In the above thumbnail sketch, I made a little map of this to the right of the drawing before I started to sketch. It gave me a pretty good idea of how the ellipses would appear. 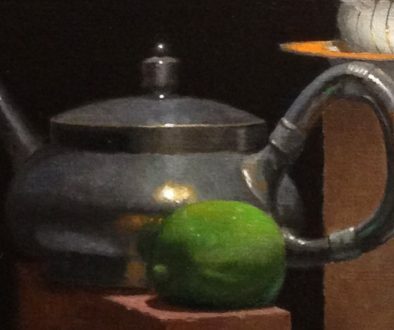 Once I transferred the thumbnail to the canvas, I corrected them a little – but not much. I find that with a solid basic understanding of perspective, and the intuitive feel that comes from experience, solutions like this nearly always deliver a convincing result. For those interested in formal perspective, the only book I use is “Perspective For Artists” by Rex Vicat Cole. It’s an absolute classic and answers questions simple and complex. Available in paperback from Amazon.